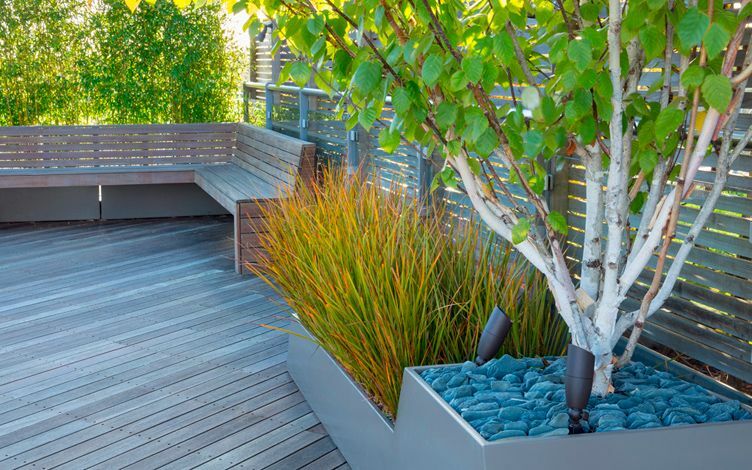 Whether intuitively conceived, meticulously detailed, or pictorially envisioned, roof garden design transformations intermix city living, horticulture and architectural landscaping into thriving and rather heavenly retreats. 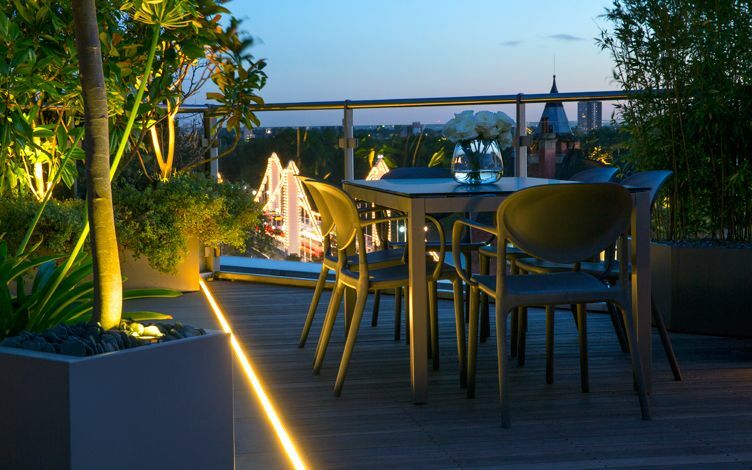 Granted, while wind shrieks through balustrades, pollutional haze dissipates gloomy mistiness and heat is unbearably scorching, roof terrace gardens can be challenging places to dwell in. 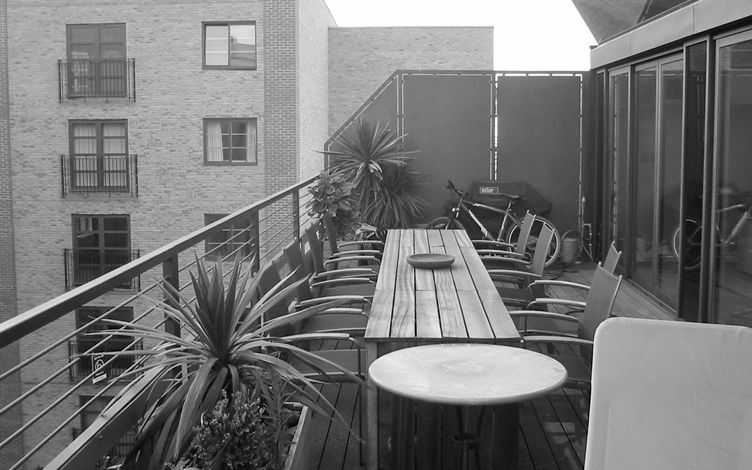 Yet, when rooftop frameworks foster contiguous architecture, inherent panoramas, functional liveability and owners' aspirations, their sense of place transcends urban complexities to sustain enticing, ecological and highly radiant environments – portrayed in these telling before and after images of our diverse roof garden design London projects. 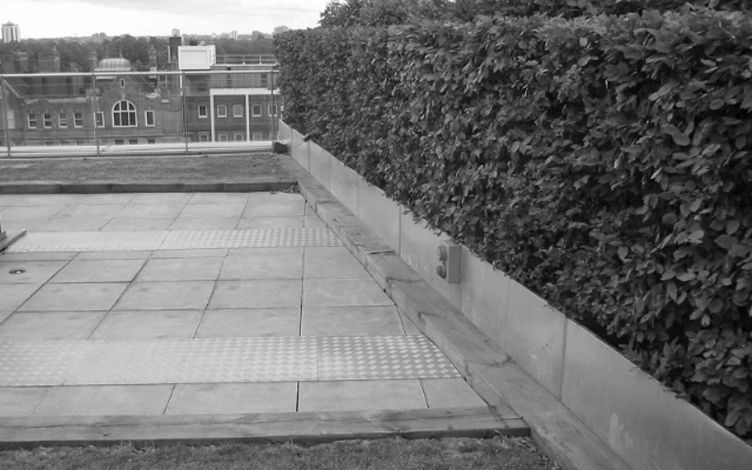 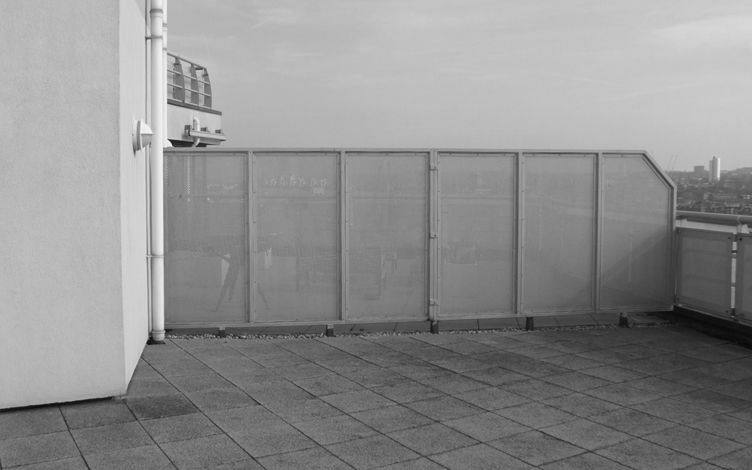 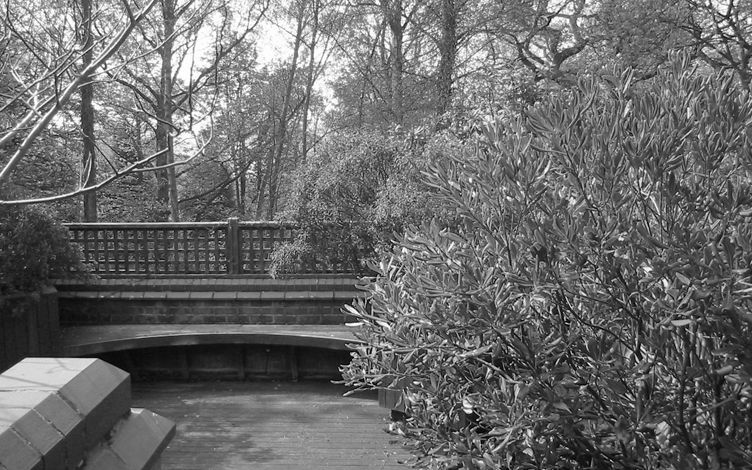 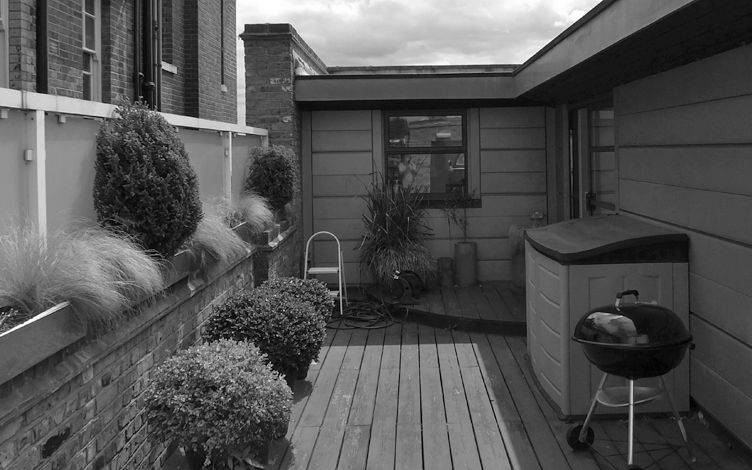 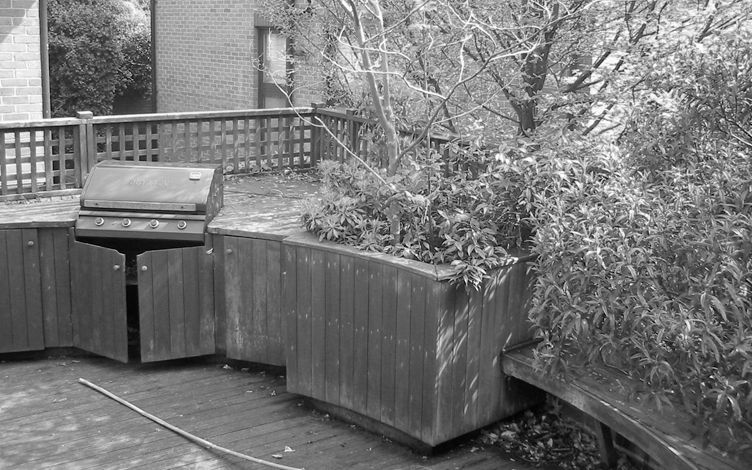 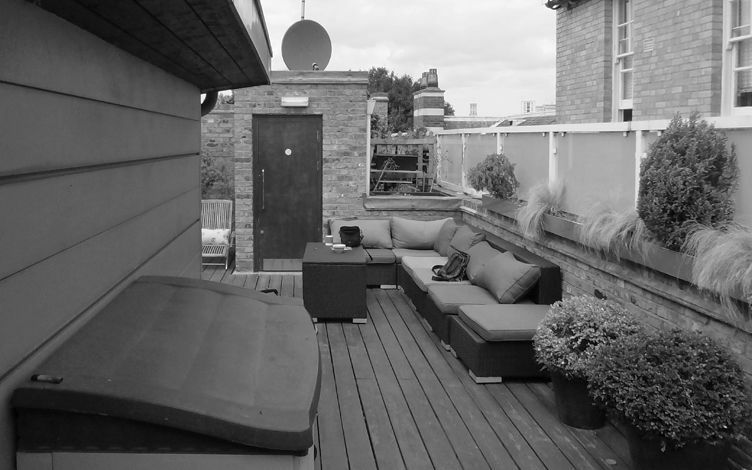 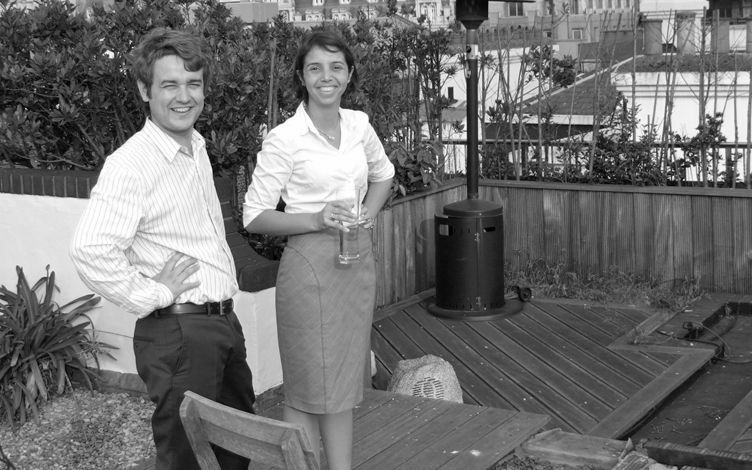 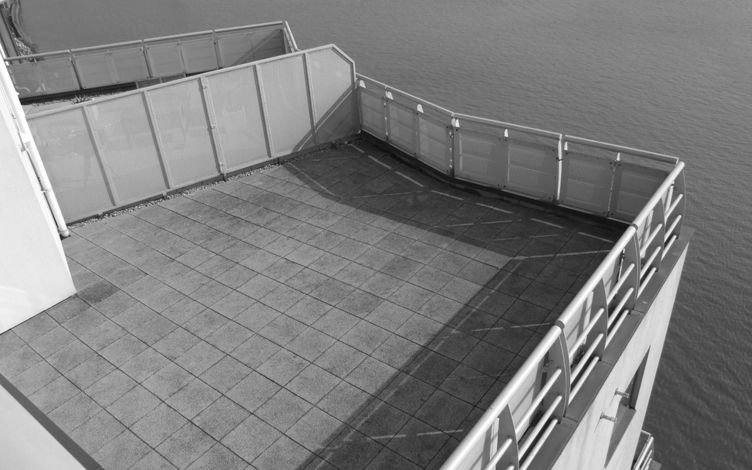 Atmospherically polluted, horticulturally unkempt and architecturally disordered are time and again the all too familiar manifestations of ordinary, untapped roof terrace settings – engendered by out-and-out unsuitability, misapplication and disengagement. 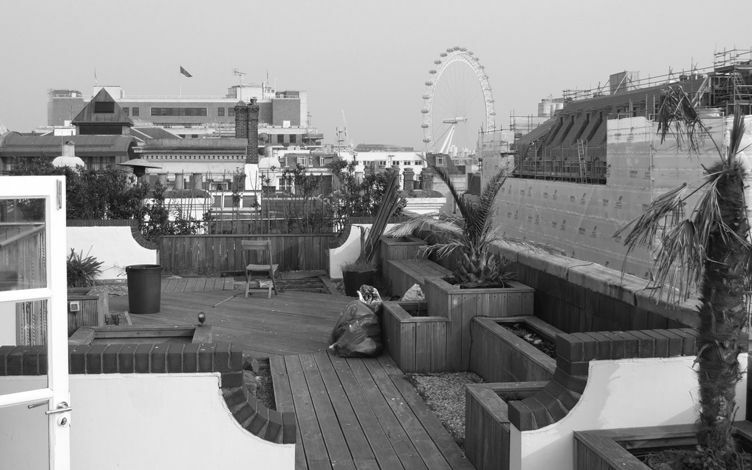 But this incongruity, when its layers disassembled, reorganised and attentively remodelled, restores rooftops' innate capabilities rather compellingly. 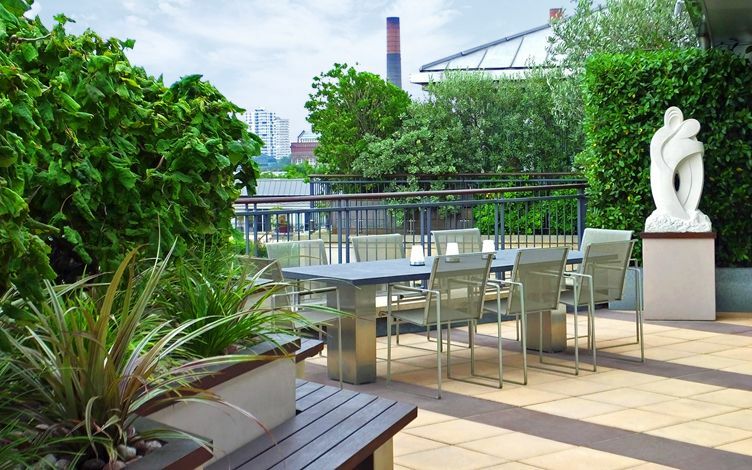 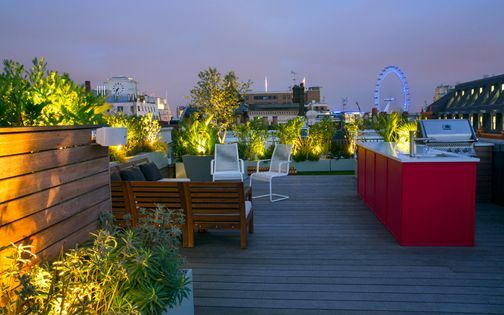 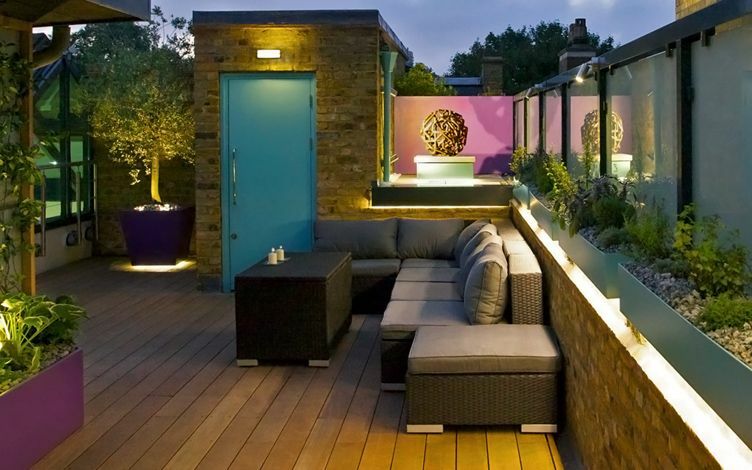 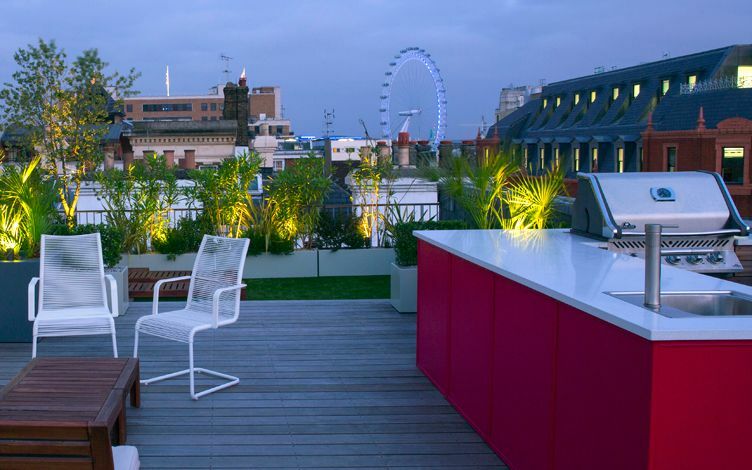 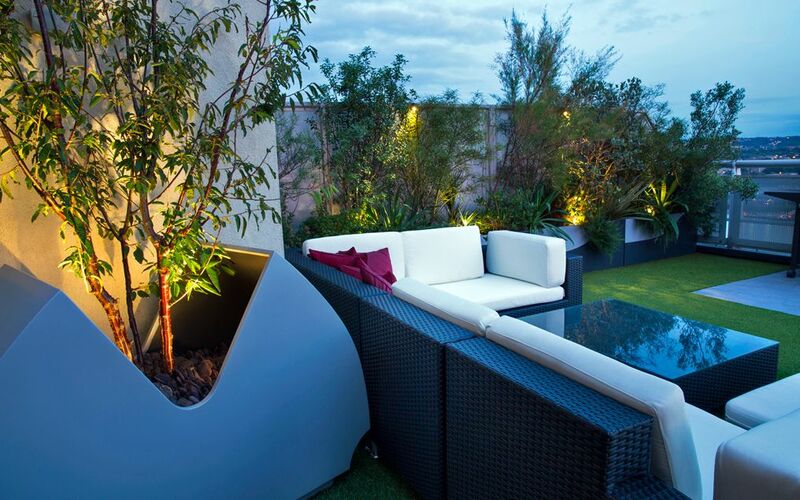 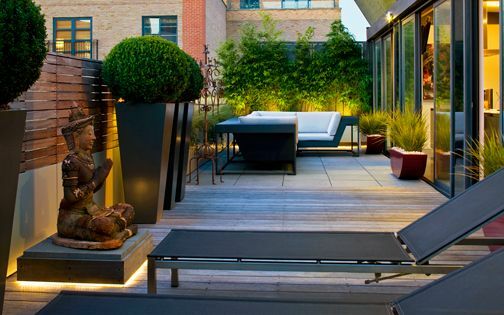 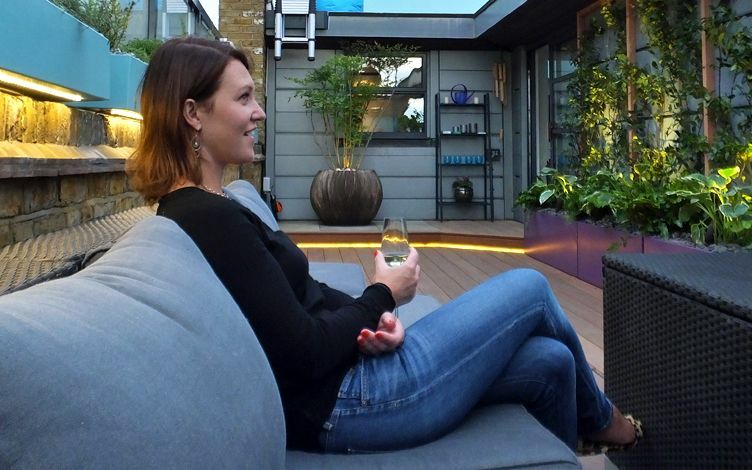 Expectedly, roof garden transformations entail intrepid visions, amid formidable logistics and extended outlays, when client-designer collaborations sustain innovative roof terrace projects consistently and fruitfully. 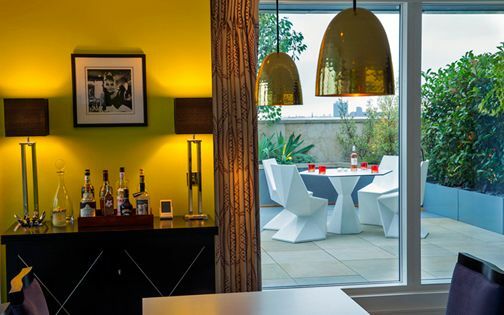 Make over, transform, smarten up, convert, overhaul, refurbish, revamp, update, or indulge in an architectural facelift, are only some of the colloquial gems we all utilise to express renovative ambitions both inside and outside our homes. 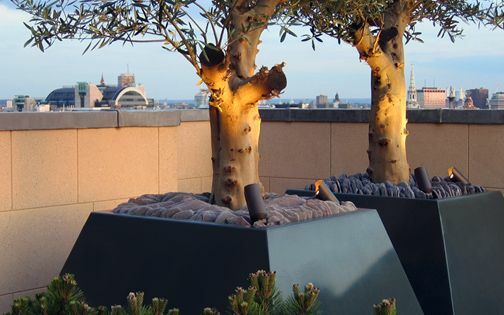 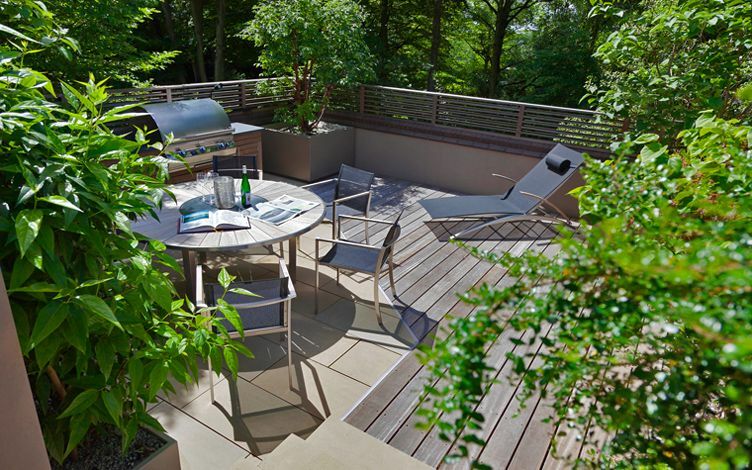 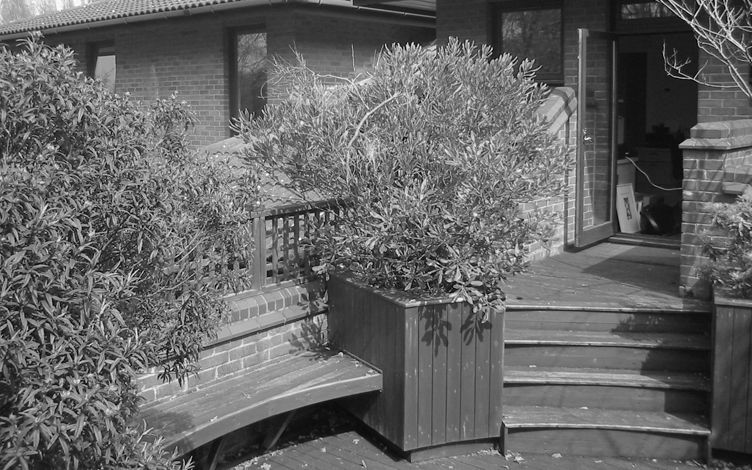 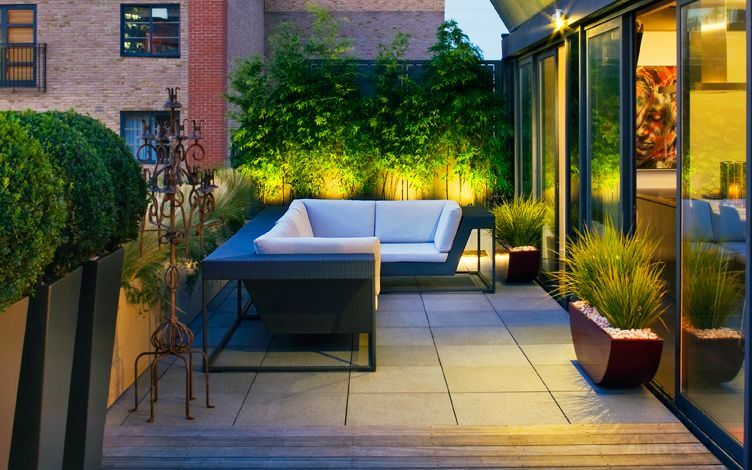 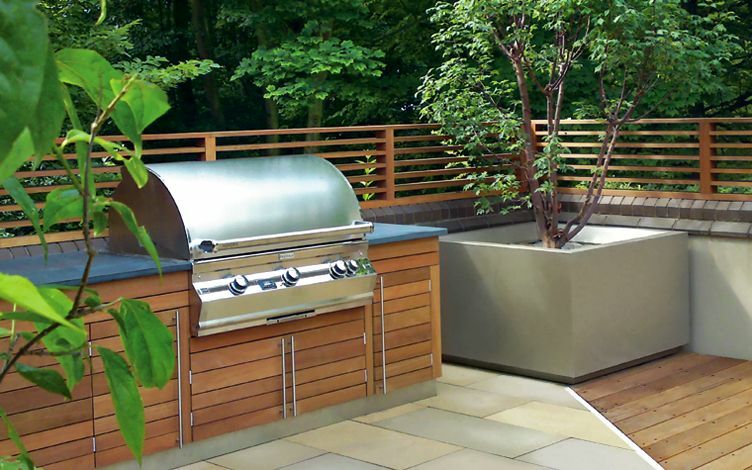 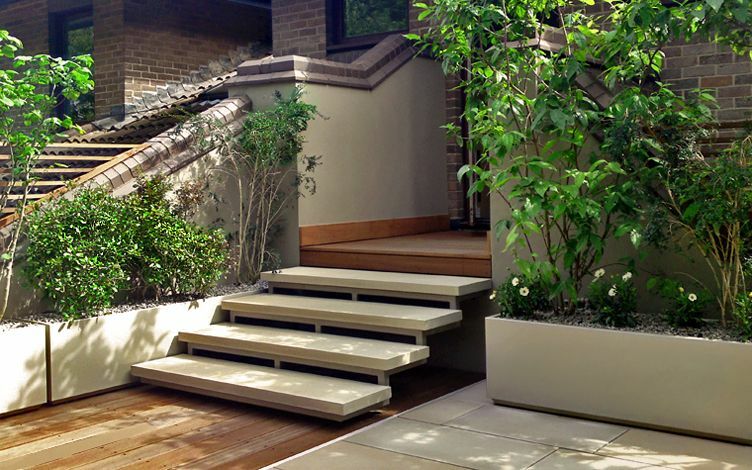 For us, every roof garden design project entails thorough research and insightful understanding of site conditions, clients' lifestyles and constructional possibilities, where a standout assemblage of rooftop design principles redefines emergent outdoor spaces. 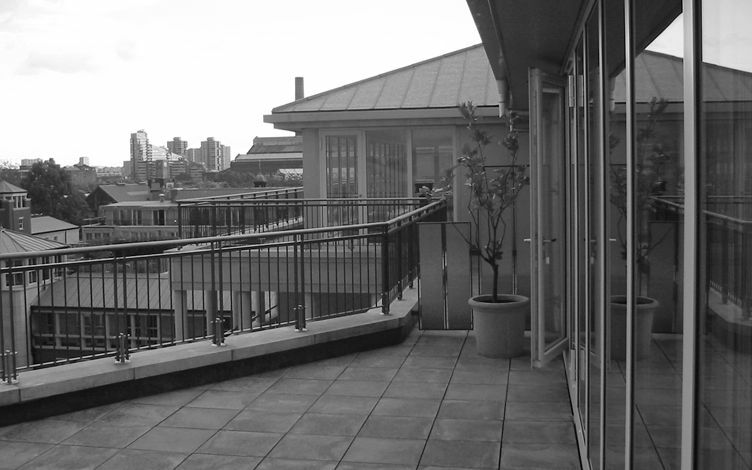 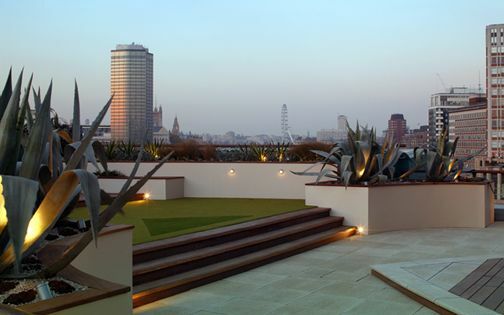 This triadic interchangeability of objectives, concepts and skills materialises every so often in roof garden transformations rich in detail and a sense of location, when lofty settings embraced collectively among modern interiors, a buoyant skyline and thought-provoking rooftop environments achieve irreplaceable well-being. 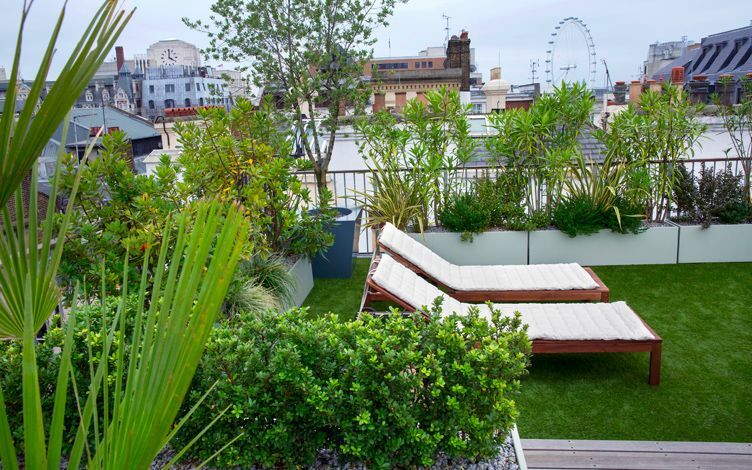 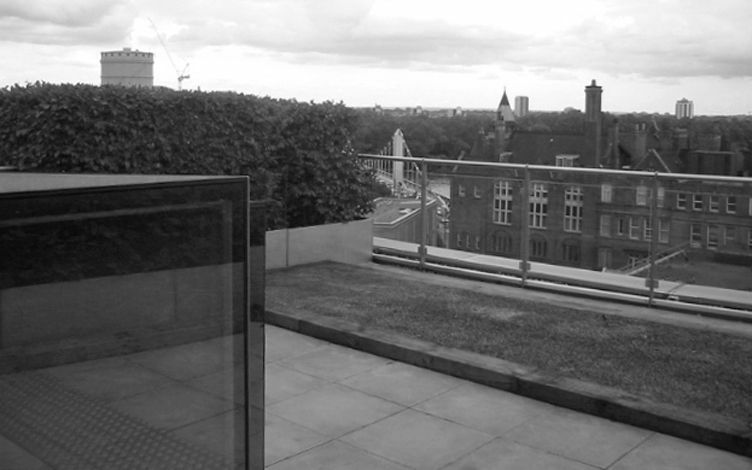 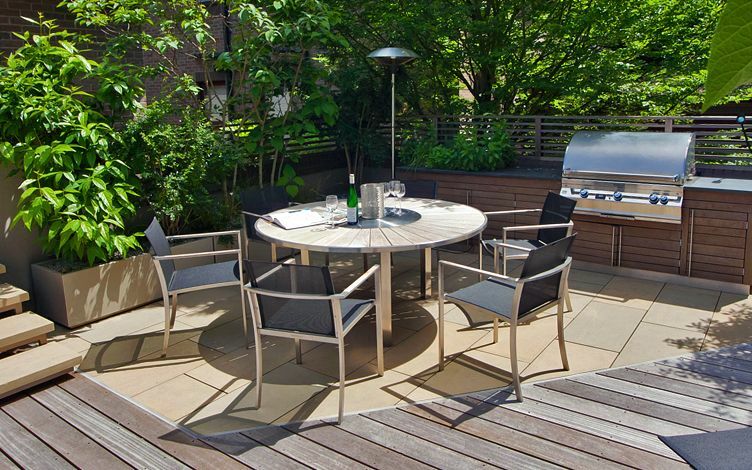 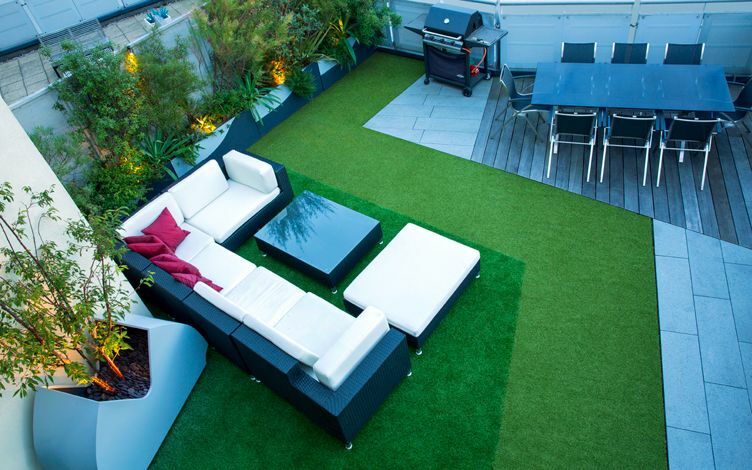 As London's green footprint steadily migrates from tellurian expanses into soaring rooftops, so do roof garden transformations continuously broaden their capacities in initiating and sustaining balance between ecological necessities and lifestyle prerequisites. 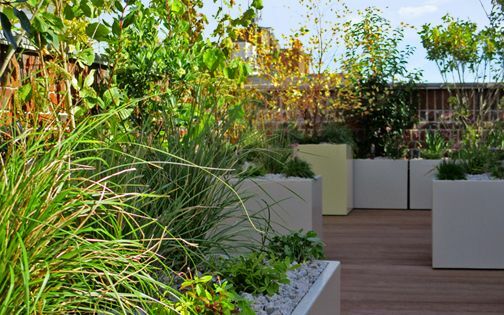 Water availability is unquestionably the be-all and end-all of every garden environment – more so across parched urban roof gardens. 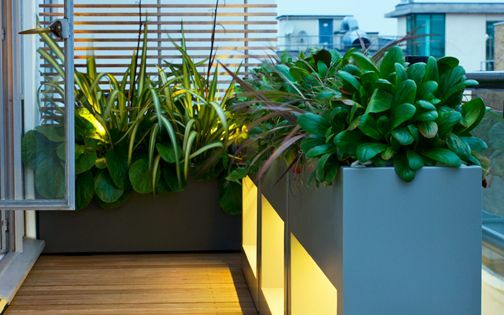 While multitudes of roof terraces are habitually developed without life-giving water provisions, we implement ingenious plumbing and cutting-edge irrigation systems to facilitate the healthy cultivation of containerised plants. 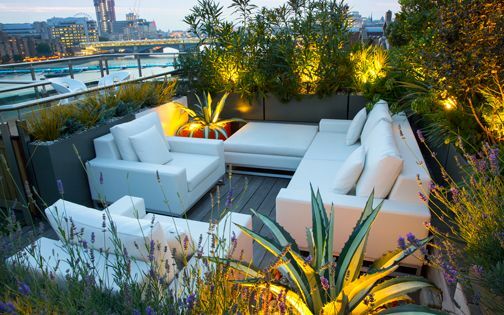 Enveloped by these leafy, healing matrices of foliage and pertinent seasonality, the seating, viewing, entertainment and lighting platforms we devise evoke effortlessness and aptness indicative of an all-encompassing landscape discipline and its contemporary way of outdoor living. 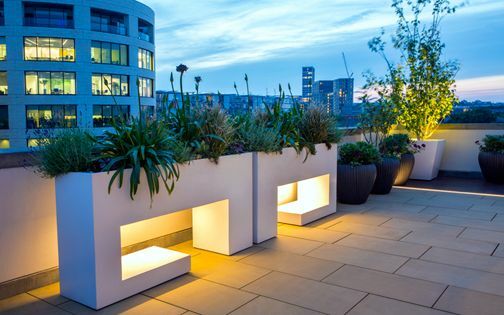 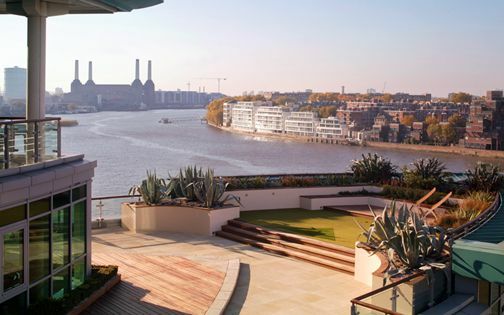 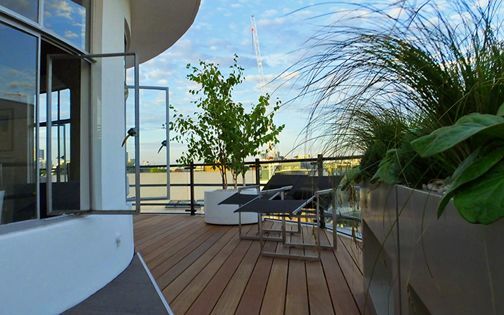 Decked, tiled, courtyard-like, atrium-styled, penthoused, narrowly l-shaped or spaciously multi-levelled, London's great diversity of roof gardens accommodates a myriad of preferences – from high-rises to period conversions and every type of brand-new waterfront residence. 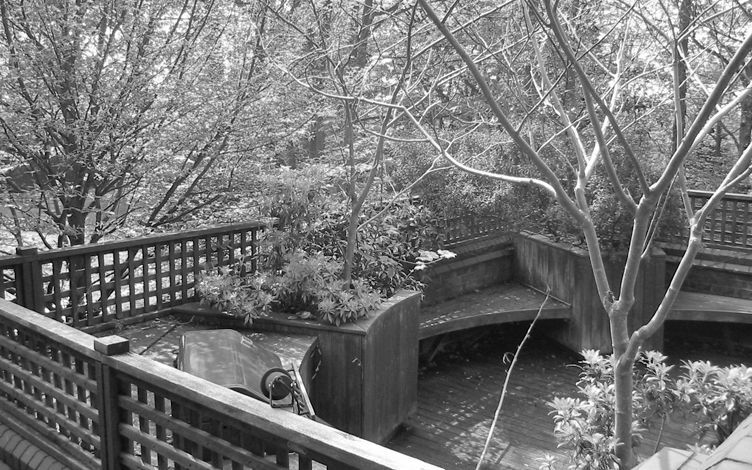 Although poles apart, these distinct architectural styles converge at a consequential intersection of profitability, sociability and scalability – forming the vertex of a sought-after urban outdoors. 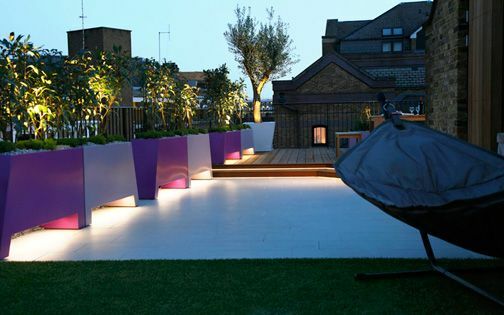 While developers conjure up roof terrace space out of thin metropolitan air, and clients yearn for precious liveability, we strive to personalise our designs for modern roof gardens in this plexus of microclimates, ambiences and scales, through a cross-pollination of transformational rooftop ideas.